Come and enjoy our traditional breakfast hospitality. 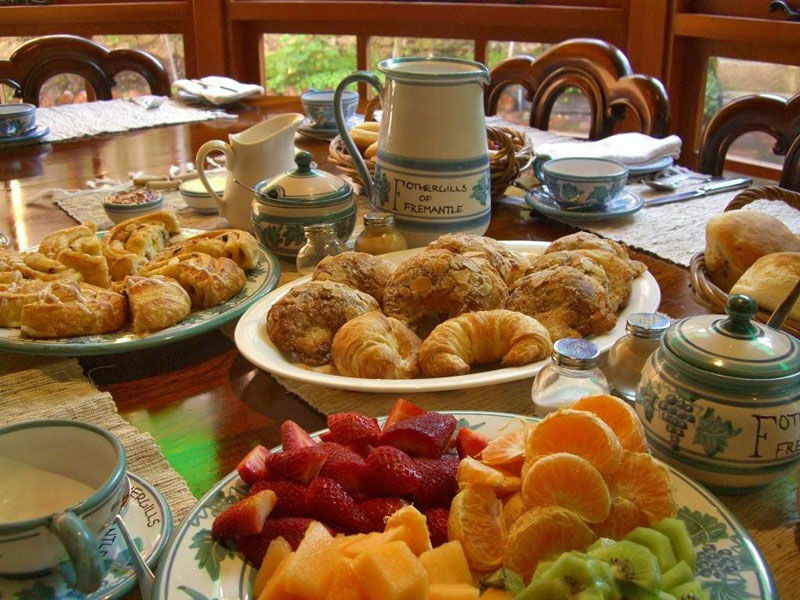 One of the very few Fremantle Bed & Breakfasts where you will still be offered a grand cooked breakfast. For guest booking directly with this start to the day is included in your rate; If booking is made through by a third party website there is a small extra charge. In our sun-filled conservatory we serve upon custom made plates and dishes from an eminent local potter and his wife, Stewart & Trish Scambler (http://www.stscambler.com.au/#about-us). You sit upon chairs and dine off tables made by a local craftsman. The room is decorated with paintings and sculptures by local artists. We hope to share with you the complete Fremantle experience whilst you are offered the finest local fare. Start your day with fine Fremantle roasted coffee (apologies but the tea is from further afield) while your breakfast is individually cooked. We will always offer you a traditional platter of bacon, eggs, tomatoes and mushrooms and different days may offer alternative dishes such as scrambled eggs and smoked salmon, eggs Benedict, eggs Florentine and even our own special Fothergills eggs with smoked salmon, baby asparagus tips and Hollandaise sauce. Choose from four or five cereals, a variety of breads from local bakeries, muffins and crumpets with a wide choice of conserves. Honey from local hives and home-made jams are offered along with the more usual brands. For the health-conscious mix and match a variety of yoghurts with half a dozen fresh and preserved fruits. Given some advance notice we are also able to provide vegetarian and gluten free options. Enjoy a glass of wine watching as the sun sinks into the sea each evening. Ask us at breakfast time and we can supply, at nominal cost, a cheese platter to help your wine slip down.